Justin Gilbert ran a 4.37 40 yard dash and could be the first corner taken in the 2014 NFL Draft. The 2014 NFL Combine is now in the books. We will give recaps of the players that made money by improving their draft stock. Today we move on to day four of the Combine when the defensive backs were on display. 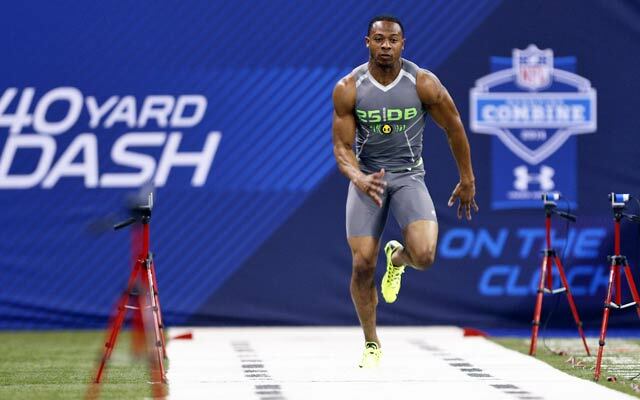 These workouts were the last of the 2014 NFL Combine. You hear almost daily…. the NFL is a passing league. Many teams use three receivers as their base set and on 3rd down, they may employ four or five receivers. Add to that the teams that like to use multiple tight ends that they line up all over the place and it’s not hard to understand why you can’t have enough defensive backs. You will never hear a team say they have enough corners. If you have two, you need three. If you have three, you need four. Safeties have also become more important, especially if they do a good job in coverage of tight ends. Safeties that can cover the receiver in the slot make your base defense even more effective since you don’t have to bring an extra corner on the field. Ha Ha Clinton-Dix – Alabama – S – (6-1 208 lbs. ): Natural deep safety that understands angles and keeps the ball in front of him. Has good range. Flips his hips and changes direction well. Has the ball skills to read the quarterback and go after the ball in the air. Some question his ability to cover slot receivers man for man, but I believe he can handle that. Ross Cockrell – Duke – CB – (6-0 191 lbs. ): Long, lean body type. Has good ball skills. May need to develop more upper body strength. Does a good job tracking and finding the ball in the air. Very smooth change of direction skills. Darqueze Dennard – Michigan State – CB – (5-11 199 lbs. ): Physical, aggressive press corner. His nickname is “No Fly Zone” because he takes on the opponent’s best receiver and shuts them down. Nice, low backpedal. Is a little bit stiff when he transitions out of the backpedal. Pierre Desir – Linwood – CB – (6-1 198 lbs. ): Small school player with good size. Has long arms and is a long strider. Very smooth. Great feet. Is raw, but has big upside. Showed good lower body explosion with a 11’1” broad jump (#1 DB and #2 overall at the Combine). Kyle Fuller – Virginia Tech – CB – (6-0 190 lbs. ): Has good route anticipation. Does a good job in off coverage. Quick feet. Is a little too high in his backpedal. Has ability to cover slot receivers. Has good instincts and is always around the ball. Broad jumped 10’8” (tied for #3 DB). Phillip Gaines – Rice – CB (6-0 193 lbs. ): Came into the draft process as a relative unknown, but has improved his draft stock with good showings in the Senior Bowl and the Combine. Has good length and long arms. Very smooth backpedal. Very smooth transition out of his backpedal. Tracks the ball well in the air. Ran a 4.38 40 yard dash (#2 DB) and 6.63 3 cone (#3 DB). Justin Gilbert – Oklahoma State – CB (6-0 202 lbs. ): Shut down corner with very good man coverage skills. Long arms. Excellent press coverage skills. Has very good technique. Very good ball skills and is a threat with the ball in his hands. Able to catch the ball at its highest point. Very good kick returner. Ran a 4.37 40 (fastest DB) and bench pressed 20 reps (#5 DB). Andre Hal – Vanderbilt – CB (5-10 188 lbs. ): Quick change of direction skills. Adjusts well to the ball in the air. Smooth transition out of his backpedal. Stanley Jean-Baptiste – Nebraska – CB/S – (6-3 218 lbs. ): Very intriguing prospect. Played receiver, corner and safety for the Cornhuskers. Very raw, but has very good athleticism. If he is able to play corner, he will be one of the biggest corners in the NFL. Fits the mold of the Seahawks corners. Very good lower body explosion. Vertical jumped 41.5” (#1 DB) and broad jumped 10’8” (tied for #3 DB). Lamarcus Joyner – Florida State – CB/S (5-8 184 lbs. ): The exact opposite of Jean-Baptiste in regards to size. Has played both corner and safety. Some scouts do not like him because of his height, but he is a playmaker that is always around the ball. Has the ability to cover slot receivers. Quick feet. Plays a little bit high in his backpedal. I think he should be able to play safety at the next level and will bring the flexibility to cover slot receivers. Craig Loston – LSU – S – (6-1 217 lbs. ): Physical safety that is better in the box than playing deep. Does a good job flipping his hips and changing direction. Tracks the ball well in the air. Has short arms. Made the secondary calls for the Tigers and is able to get everyone lined up in the right spot. Has the ability to be a gunner on the punt team. Keith McGill – Utah – CB – (6-3 211 lbs. ): Another intriguing Seahawk type of corner. Very good length with long arms. Smooth in and out of his backpedal. Good feet. Good lower body explosion. Vertical jumped 39” (tied for #3 DB) and broad jumped 10’9” (#2 DB). Calvin Pryor – Louisville – S (5-11 207 lbs. ): Very tough, physical safety. Flies to the ball and explodes on the ball carrier. Smooth transition out of his backpedal. Good instincts. Protypical strong safety that could probably play free safety as well. Bradley Roby – Ohio State – CB (5-11 194 lbs. ): Very athletic. Was rated in the preseason by many as the top corner. Had an inconsistent year, struggling at times. Great balance. Has loose hips that allows him to change direction very quickly. Quick feet. Able to play off the receiver and still make plays on the ball. Ran a 4.39 40 (#4 DB). Jason Verrett – TCU – CB (5-9 189 lbs. ): Very smooth. Very clean transition out of his backpedal. Good footwork and quick twitch movement. The knock on him is his size, however, he is very athletic and looked really good in the on-field drills. Despite his size, he plays with a lot of heart and passion. Very good measureables. Ran a 4.38 40 yard dash (tied for #2 DB), 6.69 in the 3 cone drill (tied for #3 DB) and 4.00 short shuttle (tied for #2 DB). Vertical jumped 39” (#3 DB) and broad jumped 10’8” (tied for #3 DB). This entry was posted on March 24, 2014 by draftmaniacs in All-Star Games and Combine and tagged 2014 nfl combine, 2014 NFL draft, Bradley Roby, Calvin Pryor, Darqueze Dennard, Ha Ha Clinton-Dix, Jason Verrett, justin gilbert, Keith McGill, Kyle Fuller, Lamarcus Joyner, NFL, NFL Combine, NFL Draft, Phillip Gaines, Stanley Jean-Baptiste.